The Association for the Study of Peak Oil&Gas (ASPO) is a network of scientists, affiliated with European institutions and universities, having an interest in determining the date and impact of the peak and decline of the world's production of oil and gas, due to resource constraints. >from *The Association for the Study of Peak Oil&Gas site*. ...more than 95 percent of all recoverable oil has now been found... As of this statement, we have consumed approximately half of the recoverable oil... Since 1981 we have consumed oil faster than we have found it, and the gap between our growing consumption and shrinking discovery continues to widen. Oil is now being consumed four times faster than it is being discovered, and the situation is becoming critical. Oil is our most important energy source. Oil is the fuel that enabled the growth of modern civilization, and all industrialized countries now rely on it to an extraordinary extent. 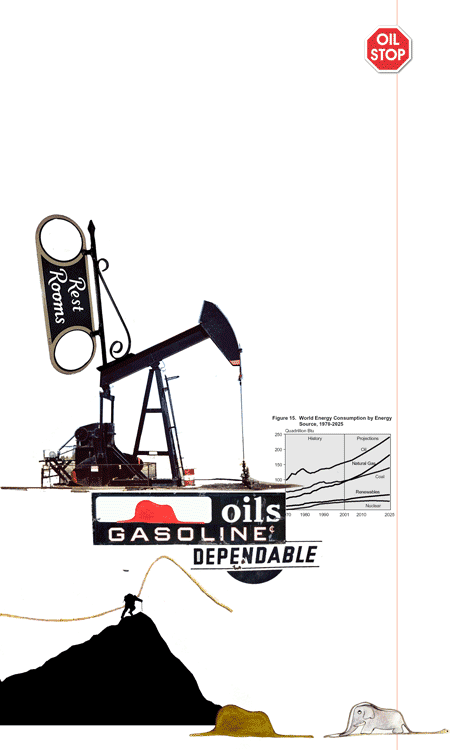 Oil provides 40 percent of all primary energy, and 90 percent of our transportation energy... In short, oil is the lifeblood of the industrial world. Worldwide oil production is peaking. Oil peak is a powerful force of global destabilization. Solutions must be grounded in science. The laws of thermodynamics and physics, as opposed to business and economics, must guide us through this crisis. Open markets are not equipped to cope with depletion of a critical resource, as they cannot foresee the serious technical limitations of various replacement technologies. Natural gas, for example, is itself a finite resource, and is already in decline in North America. Hydrogen is a commonly cited panacea, but rather than being a primary energy source, hydrogen is only an energy carrier – much like a battery. As such, hydrogen is strictly an energy loser. Replacing oil with a sevenfold increase in nuclear energy, would pose a serious and expensive waste problem. Renewable energies including solar, wind, geothermal, and biomass must be encouraged, and their potential for large-scale deployment must be assessed. Other technologies still in the laboratory, either proven or as yet unproven, may be extremely difficult to deploy in the timeframe and scale dictated by this problem. We call on all governments of the world to address this issue very seriously. Oil peak is an inevitability... We now ask that the call be heard. A first response must include decisive cuts in consumption, and a thorough reassessment of the size of the world’s oilfields. Communities everywhere must be apprised of this issue so that they may take part in creating a sustainable future. Oil peak is the most pivotal challenge facing modern civilization. It is time to come together and acknowledge our collective vulnerability, and begin working to change the structure of our culture and civilization in ways we've never attempted before. We do not underestimate the magnitude of the task, nor the consequences of a failure to act. Please join us in adopting this statement, and become part of a growing community working to respond at every level.